Home / Roof Raking / How Much Does Roof Raking Cost? The cost of roof raking varies by home. 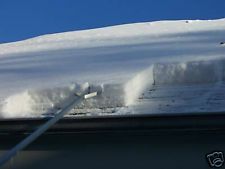 Roof raking is a snow removal method in which a professional removes a layer of snow from the roof to prevent the formation of ice dams and subsequent leaks in the home. Ice dams form when melted snow refreezes into ice. Icicles hanging from the roof are a sign of ice dams. When the gutters become blocked with snow, melted ice can’t travel through them, and the water leaks through the attic and into the home. Often, roof raking services will be accompanied by ice dam removal, which uses a low pressure steamer to melt the build-up of ice and stop leaks from happening. During the cold winter months, a build-up of snow and ice on your roof can cause leaks in your home. You may think that it will melt on its own, but when snow blocks the gutter, it obstructs the path for water to escape. This is when you need a professional, like the professionals at All County Window Cleaning in Vernon, NJ, to use the roof raking method. All County Window Cleaning is a family run business with over 20 years of experience in window cleaning, roof raking, pressure washing, and more. We are professionals and fully insured to handle this, and much more. We’ll make sure your roof is clear of snow and ice so your home stays insulated during the winter. Don’t wait until you find a leak. Have All County Window Cleaning in Vernon, NJ, remove the snow from your roof (recommended to be done after six inches of snowfall) with roof raking and gutter cleaning to prevent ice dam formation. Call today at (973) 827-8311 and get a free quote. we’ll be happy to tell you how much roof raking costs for your specific home.